Abandoned Pipeline Decommissioning - Global Diving & Salvage, Inc.
A 19-mile AMOCO pipeline was legally abandoned in 1974, but multiple leaks were detected along the abandoned pipeline beginning in 2001. Global was hired to decommission the Cook Inlet pipeline. The project required installing underwater hot taps, pipeline alignment, excavation of buried sections, and attaching surface suction lines to an anchored barge. Divers used a Broco torch to sever the pipes, then fresh-headed them with a hydraulic guillotine saw. 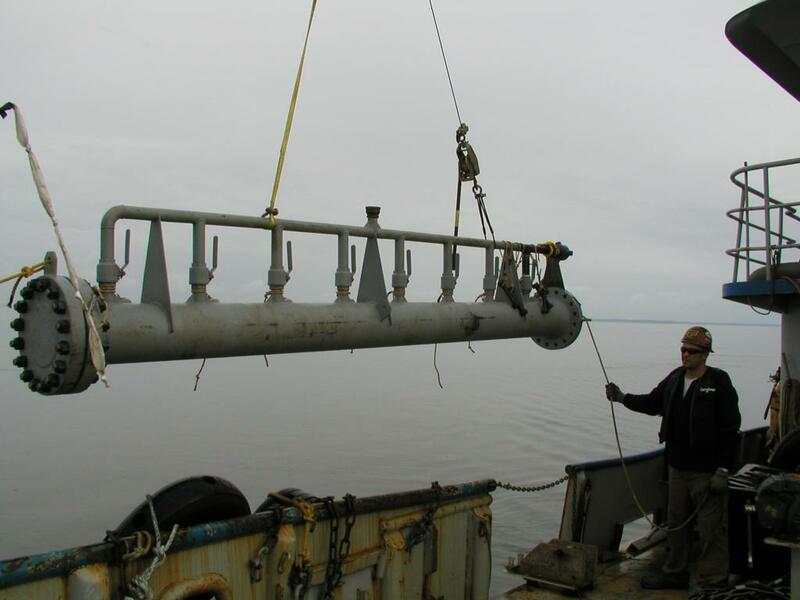 The divers then installed 400 lb hydraulic clamps at each cut, and a sub-sea pig launcher was connected. The pumping of a gel train through the 10-inch pipe for internal cleaning was prevented by multiple breaks in the heavy wall pipeline. Instead hot taps were installed to provide a method to vacuum the line contents to vac trucks located on the support barge. The sequence of events was repeated a number of times at the line high points to complete the cleaning of the entire line for accepted abandonment by the ADEC and EPA. This work was completed in zero visibility during the slack tides in Cook Inlet, known for its extreme tide range of approximately 40 feet difference between high and low tides.